A Vicious Example by Michael Aiken. Grand Parade Poets, 2014. Recently I was told by an author that there is nothing original to be said in literature. I disagreed and stated that there are at least three types of people who have the ability to create something original; the crazy, the lucky and the genius. The genius is the rarest and most sought-after. People all over the world flock to cities to see if they have the ability to offer something new and to be a success. I received a terrible shock when I left my home town and moved to Sydney at eighteen. What I found was loneliness, crowds and excitement, I found new worlds of people involved in the arts, in the same streets as city violence and overpowering competition. A Vicious Example took me to the places I had been in my years of city life. Michael Aiken conceived many of these poems while working nights as a security guard. He would spends hours watching the world around him while guarding trucks or parking spaces. It was in these nights that he saw in the city of Sydney, the people who inhabit her and the wildlife that have just as much a claim. Aiken, in this book of poems, is not crazy, lucky or displaying the qualities of a genius. There are moments of outstanding and memorable work in the poetry, also there is quality, great reflection and joy. He captures the reader and presents them with the nature of Sydney. The poems which brought the city to life are the most enjoyable and powerful of the work. The early pages of the book are no match for the last pages. In ‘Night music, the mall’ we are presented with the essence of the work without the joy, “and the c.d. in the mall/ was opera avant garde:/some dame, but skipping.” and “at ten pm/a cloud of gulls/ in silence/ surrounds the mall.” These are familiar scenes but without love. Perhaps these are weakest, but have been left in the collection just in case they are found and loved by the reader. They do not seem to have been crafted as honestly as the more powerful poems, they are littered with weaker words that have not been bled over. The work would be as strong without them. …..all that clear Spring air. But the work soon comes alive. Excitement comes as if, like the city of Sydney, we have arrived in the right part of town at the right time of night: just as the lights come up and the interesting folk awake. The greatest work is ‘Sydney: 1934 1392k1 – 1811 1682k2’. Aiken, a poet of reality and dreams overcomes the challenge presented to all writers and speaks directly to the reader. Here he achieves all he set out to, combining the city, the people and the wildlife. While I lived in Sydney, I would wander to a vantage point and watch the Anzac Bridge at night. I would marvel at the gulls as they swooped and feasted in the great lights of each tower. I once wanted to take a girl I liked down to see the birds and was rejected mercilessly for such a strange offer. Aiken allowed me to touch the soul of the city I knew. Here his words were chosen carefully for full effect. for the bus ride home? He carries the reader in the night world of bright lights, where hungry cats must find food or die, where people are lost on the streets, out of the warm living rooms and kitchens of their homes, if they have one. The work is born in modernity, yet has an ageless quality. There is some fat which should have been trimmed but it shows the reality, horror, beauty and struggles of city life. He has achieved the honesty that artists must achieve. The cold and changing city of Sydney has been brought to my bookshelves. This is a book to see. He is a poet to watch. David O’Sullivan is a writer who loves reading, walking in forests and philosophy. His debut novel The Bomber was released June 24th with Pen Name Publishing. 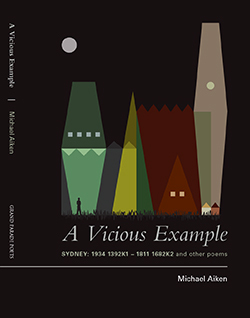 This entry was posted in A Vicious Example, David O’Sullivan, Grand Parade Poets, Issue 15, Michael Aiken and tagged Australian Literature, Australian poetry, literature, poetry, Sydney by Mark Roberts. Bookmark the permalink.